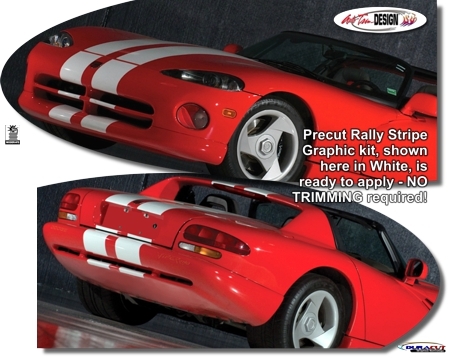 Make your '92-'95 Dodge Viper "Tough-looking" with this awesome Rally Stripe Graphics kit. This stripe package is not just a box of straight strips. Our graphic kit consists of tapered, prefitted and contoured pieces as shown in the illustration - straight stripes will not work on this vehicle. Thus, due to the fact that this kit is created specifically for the '92-'95 Dodge Viper it will not fit any other vehicle. Stripes require center spacing of 4" (101.60mm) at time of installation as per our detailed Parts List. Trimmable Spoiler Kit #ATD-DDGEVPRGRPH20 consists of two (2) pieces 16" (40.64cm) in length that can be trimmed during installation for custom spoiler applications. Pieces provided with this kit DO NOT lap into such areas but rather stop, with slight margin, at the end of each panel of application. Margin of vehicle paint exposure from panel edge ranges from 0.0625” (1.58mm) to 0.125” (3.175mm).